Muses! While I was away on my impromptu vacation to Dublin and London, I was still thinking of you guys and ways to make your day better. So I present to you a wonderful Shabby Apple giveaway. I worked with them last year for a great giveaway and thought it would only make sense to offer you another chance at a beautiful skirt, dress or top for the summer. This online dress boutique specializes in vintage dresses and then some, so you have a ton of options for a great look. This is my latest piece from Shabby Apple and I totally love this vintage yellow lemon drop skirt. It fits like a glove when I wear it high-waisted. I'm typically a size 4, but I ordered this skirt one size down for a better fit. a Rafflecopter giveaway And if you want to shop right now, use code FanFavorite10Off for 10% off your purchase for the next month! This is so aweseome Cheryl! I love Shabby Apple. Loving all the skirts they're coming out with. YOURS is pretty. That yellow looks great on you. I would choose their Calliope Skirt! Fun! Fun! That skirt really looks great on you, Cheryl. Such a happy colour, eh? Cute skirt! You look gorgeous in yellow! My favorite dresses are the Kenya wrap dress and the Marco Polo wrap dress! My favorite item is the Marhta's Vineyard dress or the Tiber dress. Thank you for the amazing and stylish giveaway! I love the skirt you are wearing, but i ALSO love the Calliope Skirt! Love that skirt on you - Great color & the polka dots are too cute! I seriously cannot narrow it down to just one thing. I adore retro silhouettes, so there are so many things I would want. Thanks, Cheryl, for a great giveaway! Keeping my fingers crossed! What a fabulouse giveaway! All the best to the winner. And yes, your lemon skirt is chic. Wow.... amazing look Cheryl!!! I love yellow and polka dots!!!! Tnx for your lovely comments on my blog darling! This is so pretty, lurv it. That's one fantastic giveaway. I love the Starboard Bow Dress. yellow is DEFINITELY your color! you look beautiful. You look adorable! I love that dress, and I love that you paired those lace up shoes with it. So perfect! You are a ray of sunshine Cheryl, this look is so pretty and cheerful! Such a great giveaway! I Love Shabby Apple! Great skirt and I love your outfit!!! Sweet! Love the Blue Racer Skirt! You are rocking that skirt! I love the Rootbeer Float dress from that line! Great skirt, and good luck to all. Have you considere removing the WORD VERIFICATION??? Love and admiration, my friend. Hey Cheryl! Hope you're well. I love the gorgeous red West Coast Swing dress! Que guapisima!!!! el vestido es muy bonito. Cute skirt, Cheryl! I love the Headliner Dress. I love the MS porter dress...so cute with the zipper down the back..love it! thanks for the chance to win. I love the Elizabeth Islands dress! It's so perfect for summer. love that outfit! 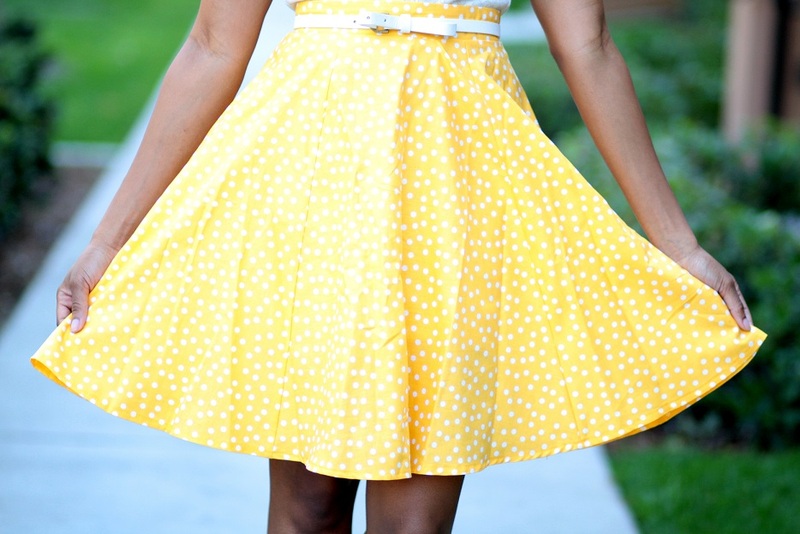 the yellow skirt is just amazing. Love the Pop Mode dress! Love the yellow polka dot skirt Cheryl! What a brilliant colour and looks fab on you! the gondola dress is my favorite! This week I love the Royal Wedding dress :) cute, it looks like the cut the cake dress :) just a different color. I love so many of their dresses. To pick just one, I'd say the Root Beer Float Dress. I love the WATERMELON WAVE dress! I like the knave of hearts dress! I like the Bistro Blouse! I am always looking for fun statement jewelry and really love the San Remo ring! I really love the EYE CANDY dress! I love the "soul mate" dress! I would love the Da Vinci dress. I really like the Barefoot in teh Park Dress.